Since Mars Odyssey sent back data about nearly unlimited water on Mars frozen beneath the surface, talk of sending manned missions to the red planet is everywhere. Many are even advocating colonies on Mars. Some see the 1967 Outer Space Treaty as the main obstacle, as it would ban the United States, or any other nation from claiming Mars as its territory. No one is even considering how this treaty between the U.S. and the former Soviet Union arrogantly assumed that there is no life in the universe, save on earth. There is some talk of life on Mars in the mainstream press, but only of microbes. The fact is that there are other forms of life in the universe, and many other species have advanced way beyond humankind. 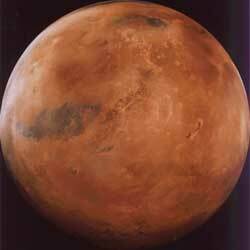 Among these beings of higher intelligence and technology are the Martians. "We have known about the existence of the Zhti Ti Kofft, as the Martians call themselves, since the Viking mission! Why is NASA pretending we do not?" Former NASA employee and Mars expert Harvey Kurtz incredulously asked. "We have seen the face and the pyramids on Mars. We have intercepted their radio transmissions, we have even seen the irrigation canals they used to move water in the distant past when they lived on the surface, and Mars was warm. I fear that if we land men on their soil, they will view it as a hostile act, and launch a full scale attack against Earth!" Mr. Kurtz went on to add that the Martians themselves have a colony on the dark side of the moon, and that they disabled Apollo 13. It would have discovered a great deal about them if it were allowed to land. Even without Apollo13, we have discovered a great deal. "They have a giant death ray on the dark side of the moon, and technology to turn the moon around and aim it at us. We know this from the secret Apollo mission files, and from information stolen from the former Soviet Union by spies. They could use the death ray to vaporize our oceans, covering the entire globe with a deadly hot steam. They could use it to incinerate our cities. They would then be able to take Earth over with ease. We have done many things that upset the Zhti Ti Kofft in the past, but actually landing men on their soil would really provoke them! Read our previous stories about Mars Polar Lander, and Mars Climate Orbiter.